US Ambassador to the UN Susan Rice Lies Through Her Teeth About N.Korea and Bill Clinton……. – The Tundra Tabloids……. US Ambassador to the UN Susan Rice Lies Through Her Teeth About N.Korea and Bill Clinton……. Puhleeeeeze. Who does she think she’s kidding by saying that the US didn’t negotiate with terrorists during the high profile visit of former US president, Bill Clinton, to that nightmare state called North Korea? 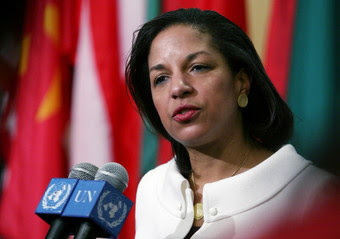 Rice ridicules the former US Ambasssador to the UN, John Bolton for his remarks that Clinton’s visit “becomes periously close to negotiating with terrorists.” She couldn’t even hold back a smile when she said that the trip “was of a private citizen and that he was not speaking for the President of the US”. What a bald faced lie. NOTE: Here is what a real political analyst / expert has to say about Clinton’s visit. Previous Post Previous Post PMW in Foreign Affairs Committee of US House of Representatives……. Next Post Next Post Buffoonery Alert: Fattah’s Only Jew Seeks Position on Revolutionary Council……. Rice is an Obama goose stepping lackey!!! We "don't negotiate with terrorists"????? Let's see Chavez, Castro, Assad, Ahmedinejad, Zelaya, etc.????? Thanks Carlos for the input. This woman couldn't even hold a straight face throughout all the conversation with the interviewer. She knew she was lying…I really long for the Bolton years. Could someone remind me again the terrorism committed by North Korea? Really. Just trying to keep my terms straight. N.Korea had its agents blow up a S.Korean airliner some years ago, they have yet to come clean with it, as well as harboring Red Army Faction terrorists and proliferating nuclear technology to other terrorist supporting states like Syria. Let's put it this way, there was no one good reason to remove them, other than pure politicking over their nuke programs.